LOCATION.--Lat 40°58'51", long 74°57'12" referenced to North American Datum of 1983, Blairstown Township, Warren County, NJ, Hydrologic Unit 02040105, on right bank 1,200 ft upstream from bridge on State Route 94 in Blairstown, 1,400 ft upstream from Blair Creek, and 10 mi upstream from mouth. PERIOD OF RECORD.--October 1921 to September 1976, October 1977 to current year. REVISIONS HISTORY.--WSP 971: 1942. WSP 1382: 1952-53(M). GAGE.--Water-stage recorder with telemetry. Concrete control at current location since Aug 1941. Datum of gage is 335.86 ft above NGVD of 1929. Prior to May 23, 1922, a non-recording gage was located at former highway bridge 1,300 ft downstream of current location. From May 23, 1922 to Jun 24, 1931, a water-stage recorder was located 1,300 ft downstream at former highway bridge. Water-stage recorder was located 100 ft downstream of current location from Aug 8, 1931 to Jul 28, 1939 (same datum). Water-stage recorder was relocated to current site on Jul 28, 1939. A concrete control was 280 ft downstream of current location from Aug 1931 until it was destroyed in Jun 1941. 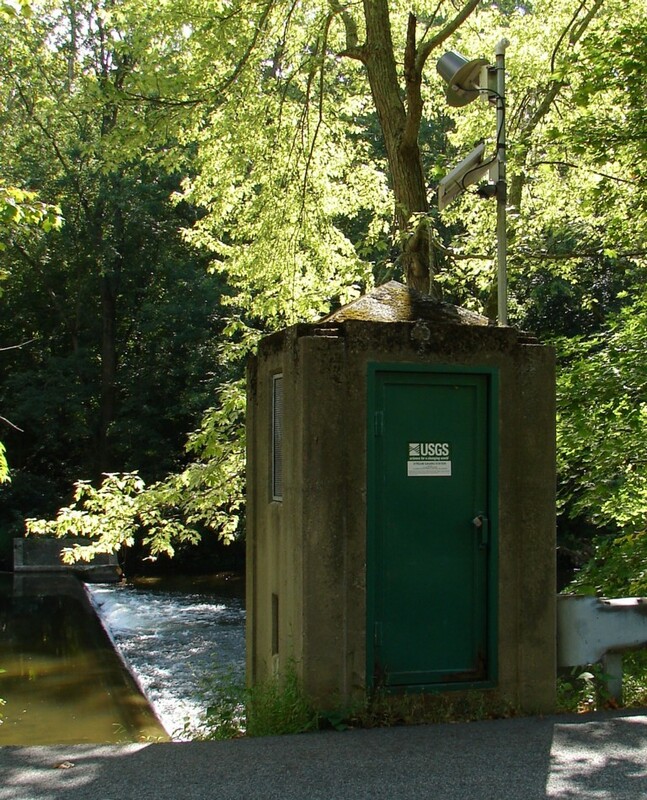 Water-stage recorder was temporarily relocated to old site (100 ft downstream of current location) from Jun 9 to Aug 4, 1941 during construction of current control. REMARKS.--Records good, except for estimated discharges, which are fair. Temporary fluctuations caused by unknown source and flow regulated slightly by Swartswood Lake and other lakes and ponds. Pumpage from limestone quarry entered tributary upstream from gage for about 60 years, but largely ceased in April 2004. EXTREMES FOR PERIOD OF RECORD.--Maximum discharge, 8,750 ft³/s, Aug 19, 1955, gage height, 11.12 ft, from high-water mark in gage house; minimum discharge, 2.8 ft³/s, Nov 1, 1922. PERIOD OF RECORD1.--Water years 1921, 1925, 1957-60, 1962-63, 1976 to current year. National Weather Service flood stage for this gage is 5 ft.